Now that we’ve gotten through another winter, many of us can’t wait to get outside and start enjoying the warm weather. Spring and summer are the perfect seasons for a variety of outdoor activities, and a favorite activity for many is grilling out. If you’re using propane for your kitchen range, you already know about how easy it is to cook with propane. Whether you have a dedicated propane line to your grill or you use changeable propane cylinders, the taste and smell of food cooked on a grill is one of the best things to love about warmer weather. Before you invite friends and family over for a cookout, you’ll want to make sure your grill is ready for the season. Clean your grill – making sure your grate is clean, your burners are free from residue, and your supply lines are clear will go a long way toward a successful grilling session. Check connections – using a solution of mild soap and water, you can check your hoses for leaks or poor connection. Make sure you have enough propane – if you use propane cylinders, make sure you have enough on hand to cook your meal; you don’t want to run out and have to finish cooking your food in the microwave. If you have a dedicated propane line to your grill, you’ll always have a steady supply. Position your grill in an open location – Grills get very hot and produce smoke, so using them outside is very important. Be sure to position your grill away from childrens’ play areas or flammable materials. Light your grill with the lid open – Lighting your grill with the lid closed can be very dangerous. Open the lid before you light it, and close the lid once you’re certain the burner is fully lit. This will help the grill heat up and be ready for cooking. Just about anything can be cooked on an outdoor grill. The most popular foods, of course, are meats of every type – everything from hot dogs and burgers to ribs, chicken, and fish. You can also cook vegetables on the grill. There are numerous cookbooks, recipes, and online resources dedicated to cooking on a grill, and dozens of accessories to help with the task, from grill baskets to griddles to pizza stones and so much more. But no matter what you decide to cook on your grill, be sure to do so safely. As tempting as it may be to roll your grill into the garage on a rainy day, always use your grill outdoors in a well-ventilated area. Do not store cylinders in an enclosed space. After grilling, make sure the burner is shut off and the grill is completely cooled before covering. When not in use, grill burner controls should be shut off and the cylinder valve closed. Keep children and pets away from the grill when in use. Locate the grill away from flammable or heat-sensitive materials when in use. Never allow children to tamper or play with the grill or cylinder. 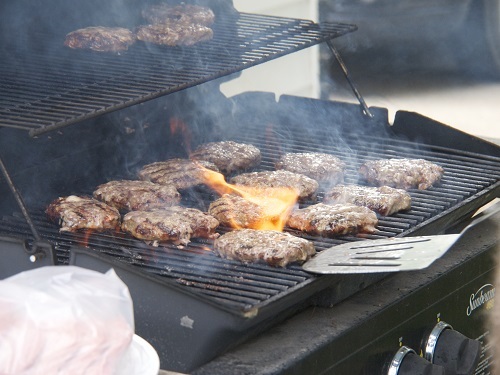 If the grill catches fire or there is an uncontrollable release of gas, call 911 immediately. Do not attempt to move the grill or put the fire out with a fire extinguisher. Move people and pets away from the grill. Whether you’re a basic burger flipper or a full-on gourmet griller, using a gas grill to cook your food outside is one of the most enjoyable uses of propane. By employing safe grilling techniques, you’re sure to have delicious meals from the grill all season long.